This 37-story rental apartment building is in the lee of River House (see The City Review article), one of the city's most spectacular, glamorous and legendary apartment buildings. River House is a few steps to the east at the end of the street overlooking the East River and has a very, very impressive gateway and landscaped driveway entrance. 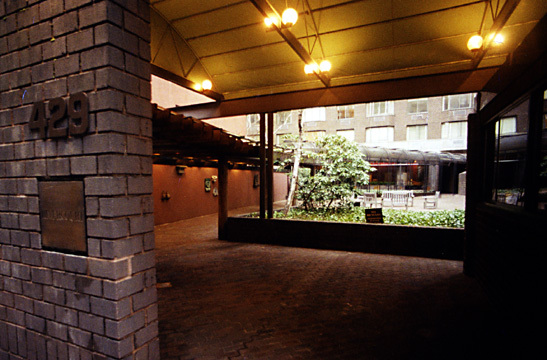 River Court, of course, is of a different generation, style and economy, but its entrance is pretty impressive as the slab tower is set back on the site close to 53rd Street and is approached through a lushly landscaped garden path from 52nd Street that on its own would be intimidating and gracious. 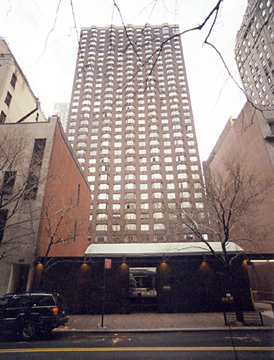 The brown-brick building was erected by the Perlbinder family in 1975 and abounds in bay windows that give its façade considerable rhythm as well as excellent views. The residents of River House may not enjoy views of River Court as much as those of River Court enjoy views of River House, but that is one of the niceties of New York. This building has 9 apartments a floor, a doorman and a concierge, a garage, a bicycle room, valet service and video security. The kitchens and bathrooms were upgraded in 1994. This is a fairly quiet street although because it is dead-end there is more traffic than on many other sidestreets. There are many restaurants in the neighborhood and there are two parks not far away on Sutton Place to the north and of course the larger park to the south at the United Nations. There is considerable traffic on First Avenue, much of it headed for the Queensborough Bridge. As far as dark-brown-brick, slad residential towers go, this is nicely done, especially because of its impressive, almost Oriental-style entrance. Residents of River House can be grateful that the developers here did not opt to site the tower with a north-south orientation, like Harry B. Macklowe did at River Tower one block to the north (see The City Review article). This building's walled, gatehouse entry and large enclosed garden preserve a lot of "light and air" for this "power" street. It's too bad that the River House, one of the city's great buildings had to be crowded, of course, but that's New York.